Thanks to reader Richard for tipping us off that Bata Shoes' former headquarters that overlooks the DVP at 59 Wynford Drive is now history and in the process of being demolished. Completed in 1965, the building has been the subject of quite a bit of debate since Bata abandoned it a number of years ago. Originally designed by Canadian architect John B. Parkin (who was also involved in the design and construction of City Hall, the TD Centre, as well as IBM's massive Canadian facility in Don Mills), it was one of the many buildings constructed during the 60's that gave Toronto a real taste of modernism. After they've cleared the rubble, the site will be the location for the $200 million Aga Khan Museum, an Ismaili community centre and cultural site. The Star's Christopher Hume said it best in April this year: "Surely there's an element of irony when an architecturally worthy building must be destroyed in the name of culture." The Toronto Preservation Board fought to have the building saved as a heritage site, but City Council, in what was surely a difficult decision, denied the request and sealed the buildings fate. Since then, it's been a subject of interest to some urban explorers (warning: cheerful music in the link) and photographers alike. 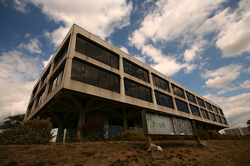 The Bata Building was a unique architectural monument of concrete and glass raised over a hill above Eglington/Don Mills by stunning columns and pavilions. For the most part, the interior (save for the "modernized" beige cubicles), was almost original complete with orange Eames shells chairs in the cafeteria, Rosewood Herman Miller Desks and Conference tables and incredible terarrazo floors and alumimum hardware throughout. While it's a real shame that the building is now in ruins, it's somewhat comforting to know that it will be replaced by a cultural facility that will do some good for the community rather than, say, a Wal-mart. Top photo by rkuchinsky. Bottom photo by blogTO Flickr pool'er inventor_77.